MY FAVORITE SPY is the third and final of Bob Hope's MY FAVORITE... films, following MY FAVORITE BLONDE (1942) and MY FAVORITE BRUNETTE (1947). Like MY FAVORITE BLONDE, MY FAVORITE SPY is a fun espionage romp. Bob's costar this time around is Hedy Lamarr, who displays a nice flair for comedy. Bob plays Peanuts White, a burlesque performer who is a dead ringer for dangerous international spy Eric Augustine (also played by Hope). Bob is convinced by a phone call from none other than Harry Truman himself to come to the aid of his country and impersonate Augustine to purchase some microfilm in Tangier. While in Tangier Peanuts meets Eric's old flame Lily (Lamarr). Hope's style isn't my favorite type of comedy, but this film, like some of his others, has some funny sight gags and amusing then-topical references. His scenes with the underrated Lamarr (one of my favorites) are quite entertaining. Some websites rumor that Lamarr was so funny Hope edited her role down so she wouldn't steal the show. The supporting cast includes Francis L. Sullivan, Mike Mazurki, Morris Ankrum, John Archer, Angela Clarke, and Frank Faylen. Martha Mears dubs Hedy Lamarr singing the Livingston-Evans song "Just a Moment More." Mears regularly dubbed Veronica Lake and Rita Hayworth in the '40s, along with many other non-singing actresses. MY FAVORITE SPY was directed by Norman Z. McLeod. It runs 93 minutes. MY FAVORITE SPY has not had a DVD or VHS release. It's a Paramount film which has been shown in the past on Turner Classic Movies. 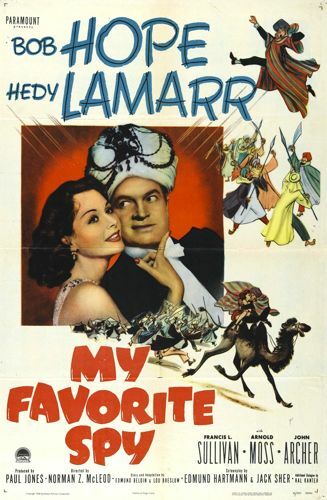 I recorded it a couple of years ago when Hedy Lamarr was Star of the Month. Fall 2010 Update: MY FAVORITE SPY is now available on DVD. It's no secret that I'm a huge Bob Hope fan and that I think My Favorite Spy--along with Son of Paleface and Casanova's Big Night--is one of the last of his great screen comedies. But the truly amazing thing in Spy is Hedy, who displays an incredible set of comedic chops as Hope's leading lady. It's a shame they never worked together again. I agree, Ivan, they were a good team. I'm glad to hear from someone else who enjoyed her as much as I did!